Behold, an Oscar candidate. A proper one. A perfect showcase in sheer acting. I may have said that a few times now but this one takes the cake. Brilliant, bold, riveting drama with the best acting ensemble I’ve seen in some time. Meryl Streep once again demonstrates why she still rakes in the nominations. Phenomenal. I may have to retract my bet on the Best Actress nod. Tracey Letts adapted the screenplay from her own award winning stage play. Some may argue that the film may be restricted to the house, a beautiful house at that. But I feel it works as the perfect wrestling ring for one of the most dysfunctional families I’ve seen since Arrested Development (as exemplified perfectly in the poster). Admittedly, I was reluctant to see this. Me? Reluctant to see a film? Strange. I know. The trailer didn’t sell it for me. But Mum’s a Streep fan and so we went . . . and was pleasantly surprised. What was strange was seeing ol’ brainbox Sherlock Holmes, Mr Benedict Cumberbatch as silly sympathetic simpleton Little Charlie. An odd, if well acted, transition. After his shoddy accent in The Island, Ewan McGregor has finally mastered the American accent. The only thing I could pick at is why on Earth did he have his teeth done? Are you Rylan in disguise?! (X Factor’s Rylan Clark. If you don’t know, who that is. Well, you’re lucky). Apart from that, very good. In all fairness, the cast were brilliantly picked for the roles. The only problem with so much talent on display, certain actors get pushed to the back of the line but the fact they are still able to make an impression, shows how talented they are and how well developed the characters were. Juliette Lewis as the younger gullible naive daughter (Not surprising that Lewis would play the dimwit but she nails it so well). Delmot Mulroney as the laid back slacker with the fancy Ferrari, trying to stay cool with the kids, reeking of a mid-life crisis. Julianne Nicholson as Ivy, the daughter that stayed while the others flew the coop. And speaking of coop, it was great to see Chris Cooper. An underrated actor who always shines. I mean only he could go from American Beauty to The Muppet Movie and nail it. Desperately trying to keep the peace in a house full of nutters, his breaking point speech was brilliantly done. You couldn’t help but root for the guy. It could be argued that Abigail Breslin and Sam Shepard were wasted characters. 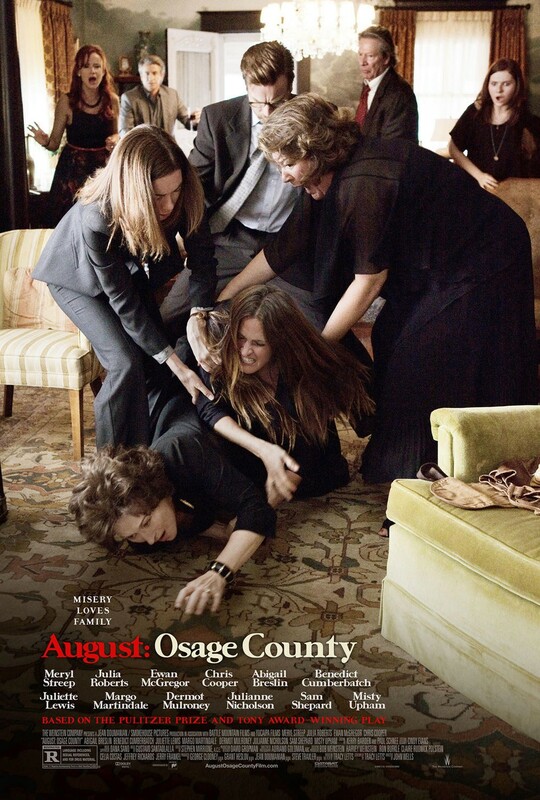 But the real story is between Violet (Streep) and Barbara (Roberts). Breslin’s character Jean was more of a foil to unearth their resentments and there is a reason for Shepard without spoiling anything. Great actor and the fact he made an impact with a mere couple of minutes, reciting TS Elliott was very good. But anyone could have played him. There are three actresses that stood out. The first was Margo Martindale (a talented actress that has played some memorable roles from some of my favourite TV shows, Dexter and The Americans. She especially struck my eye after her turn in Justified as the creepy Mags Bennett). She plays Mattie Fae brilliantly. Her chemistry with Streep was fantastic. You could have believed that they were sisters. They made it seem so natural. Now the other two and the main stars, who have been rightly nominated for Oscars respectively, are Julia Roberts and Meryl Streep as Barbara and Violet. They desperately try to keep civil during a family crisis that has finally brought all the family home, despite their strained relationship but it isn’t soon before tempers flare up and everyone’s dirty laundry is thrown about. The pair are fantastic and when they confront each other over their problems with one another, it is great to watch. Riveting and at times emotional. Meryl Streep, however, was on another level. As soon as she entered the first frame, she stole the show and dominated the film as the overbearing pill popping matriarch. Her erratic behaviour from mad ranter to a vulnerable sufferer was conveyed expertly. Her “truth telling” guilt trip at the dinner table was brilliantly done. As the film progresses, we finally get to see her vulnerability and show real sympathy for her. The final moments are a fitting end note to an impeccable performance by an incredible actress. Just watch it! Family secrets are revealed, unexpected twists and turns jump up, it all kicks off and then . . . ends quite abruptly. The ending was to be expected but it seemed to wrap up all too quickly and loosely but then when are family matters ever really resolved? But after so much build up, tension and great acting, maybe a little more time could have been spared on the final minutes, especially when one of the characters drives away in an unexpected direction. I’m staying as cryptic as possible as I want people to see this. Speaking as someone from a big family, there were so many personalities that reminded me of my own. The dinner table scene demonstrated that perfectly, especially when Violet told the men off for taking their jackets off at the table and watching them put them back on like scorned children. I haven’t seen the play that this was based on but I would very much like to now. Some may argue that the pace doesn’t justify the means but I don’t believe so. I think it allowed the simmering tension to bring to the boil perfectly, making it better for it. Currently ranks #14 out of 133!